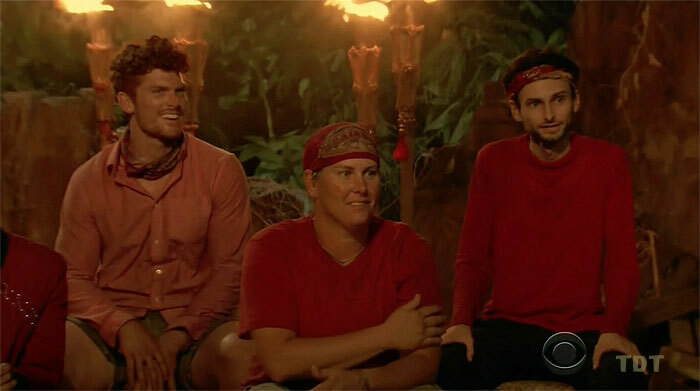 Survivor: Heroes v Healers v Hustlers (2017) - 16th place, 3rd out. Voted out in Episode 3, "My Kisses Are Very Private" (Day 8). Heroes v Healers v Hustlers Ep. 1 IC: "Tracks of My Tears" - Helps haul the cart; Hustlers don't lose! (2nd/3). Heroes v Healers v Hustlers Ep. 3 RC/IC: "Rock In a Hard Place" - Refuses to switch out on sandbags; Hustlers lose (3rd/3). Heroes v Healers v Hustlers, Ep. 2: One vote, from Simone. Heroes v Healers v Hustlers, Ep. 3: Four votes, from Ali, Devon, Lauren, and Ryan (voted out, 4-1). Still a chance at second place? Josh Wigler & Rob Cesternino at RHAP (9/11/17): "Pre-Season Interviews with Simone Nguyen & Patrick Bolton"
Josh Wigler at The Hollywood Reporter (9/20/17): "Player Profile: Meet Patrick Bolton"
Josh Wigler at The Hollywood Reporter (10/12/17): "How Patrick Bolton Met Ali Elliott"
Dalton Ross at EW.com (10/12/17): "Patrick stands by his final words"
Gordon Holmes at XfinityTV.com (10/12/17): "Patrick - 'Maybe I Could've Toned Myself Down'"
Mike Bloom at Parade.com (10/5/17): "Patrick Bolton on Sandbagging His Own Game"
Rob Cesternino at RHAP (10/5/17): "Exit Interview #3: Third Boot from Heroes v. Healers v. Hustlers"
"Pet peeves: Don't leave dishes in the sink. Pay me my money when it is due. What's your personal claim to fame? Sustaining our business, Bolt Movers, and my sanity even through its tough times. Starting and running a new business puts you through stressful situations, but my family and friends have always kept me going strong. If you could have three things on the island, what would they be and why? Teriyaki Sauce. Everything tastes better with teriyaki sauce. Next would be Takis (hot chili and lime flavor) because they are amazing and finally a pen and pad to document each play that made me Sole Survivor. Which Survivor contestant are you most like? Joe from Season 30. He was a nice guy and knew how to use his social skills to make friends in the game. When he was backed against a wall, he fought as hard as he could to win every individual immunity and save himself. He wasn't a quitter and neither am I! Why do you think you'll "survive" Survivor? I believe that I can withstand the challenges in every facet. I can solve puzzles, work well with my team, strategize, and in most cases beat out my competitors with my endurance. I can take on the outdoor elements, I can fish, I can build a shelter, and probably start a fire. I am good at bonding with others and communicating to create friendship and strategies so that my team will not want to eliminate me. I will be too valuable to get rid of, but will not outperform to look like a threat."